Ozzy Osbourne, Tony Iommi, Geezer Butler, Bill Ward - four names that resonate throughout Rock’s recorded history as clear and sublime as the bell that tolls the opening to the bands eponymous debut album from 1970. Collectively, they formed Black Sabbath and forged the most haunting and hypnotic rock sound of all time. From humble beginnings, the Birmingham quartet enslaved the minds and souls of millions of rock fans around the world and continue to do so into the new millennium. The musical genre they created inspired countless musicians and spawned countless bands. Such has been their influence; they have been inducted to the Rock and Roll Hall of Fame in 2008 and were included along Rolling Stone’s list of 100 Greatest Artists of All Time. 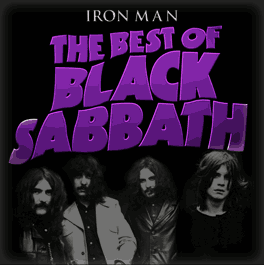 Iron Man: The Best of Black Sabbath is a 14 track collection of classic tracks from across the band’s first eight albums.